CONDITIONS OF SALE: Painting has to be exhibited free of charge continuously for 40 years. STORY: This scary mask is composed of simple monochromatic geometric shapes, and it is extremely easy to solve. 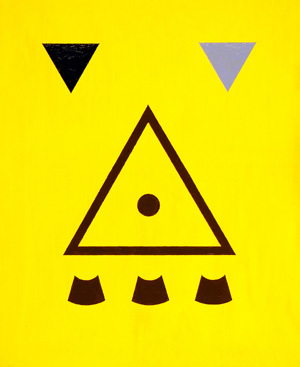 Two blue triangles ("the eyes") give the Star of David, while three black shapes on the bottom ("the teeth") complete the Trefoil (a symbol for nuclear energy) once placed inside the big triangle ("the nose"). The work refers to Israel&apos;s deliberate ambiguity toward its nuclear capabilities. This nation has not signed the Treaty on the Non-Proliferation of Nuclear Weapons, and is widely believed to possess nuclear weapons, as well as chemical and biological weapons of mass destruction. The title suggests that geometric shapes have to be rearranged on this painting to be properly understood, and are not representing visual depiction of objects (which would violate one of the basic AbFab rules). This means that the first impression (of a scary mask) is just an illusion, while the properly solved puzzle is an even scarier prospect. The price represents an estimate of Israel&apos;s population in 2012, while 40 years of continuing exhibition refer to the Exodus.